Trajan was the first in a line of adoptive emperors that concluded with Marcus Aurelius. These emperors were chosen for the “job” based not on bloodlines, but on their suitability for rule; most of them were raised with this role in mind from their youth. This period is often regarded as the height of the Roman empire’s prosperity and stability. The ancient Romans were so fond of Trajan that they officially bestowed upon him the epithetical title optimus princeps or “the best first-citizen.” It is safe to say that the Romans felt Trajan was well worth celebrating—and celebrate him they did. A massive architectural complex—referred to as the Forum of Trajan (Latin: Forum Traiani or, less commonly, Forum Ulpium) was devoted to Trajan’s career and, in particular, his great military successes in his wars against Dacia (now Romania). 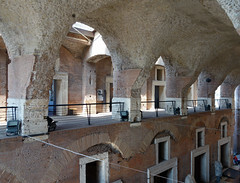 The Forum of Trajan was the final, and largest, of Rome’s complex of so-called “Imperial fora”—dubbed by at least one ancient writer as “a construction unique under the heavens” (Amm. Marc. 16.10.15). Fora is the Latin plural of forum—meaning a public, urban square for civic and ritual business. A series of Imperial fora, beginning with Iulius Caesar, had been built adjacent to the earlier Roman Forum by a series of emperors. The Forum of Trajan was inaugurated in 112 C.E., although construction may not have been complete, and was designed by the famed architect Apollodorus of Damascus. 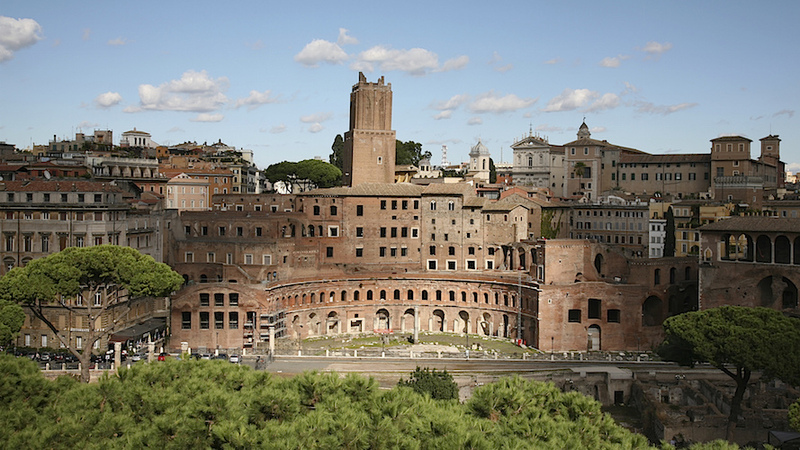 The Forum of Trajan is elegant—it is rife with signs of top-level architecture and decoration. 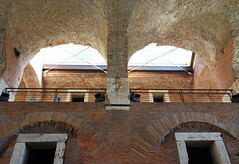 All of the structures, save the two libraries (which were built of brick), were built of stone. There is a great deal of exotic, imported marble and many statues, including gilded examples. 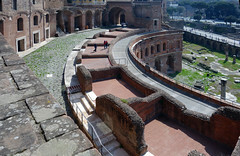 The forum was composed of a main square (measuring c. 200 x 120 meters) that was flanked by porticoes (an extended, roofed colonnade), as well as by exedrae (semicircular, recessed spaces) on the eastern (above) and western sides. A contested element of the reconstruction of the forum complex is a temple dedicated to the deified Trajan (the deceased emperor had been declared a god). Traditional reconstructions place this temple behind the column, although a recent reconstruction favored by Dr. Roberto Meneghini does not agree with this conjecture, instead preferring to place a shrine to the deified Trajan at the southern end of the forum abutting the retaining wall of the neighboring Forum of Augustus. Scholars continue to debate the nature and position of this temple. The main structure at the center of the forum complex is the massive Basilica Ulpia, and beside that stood two libraries that flanked the Column of Trajan, an honorific monument bearing an elaborate program of sculpted relief. 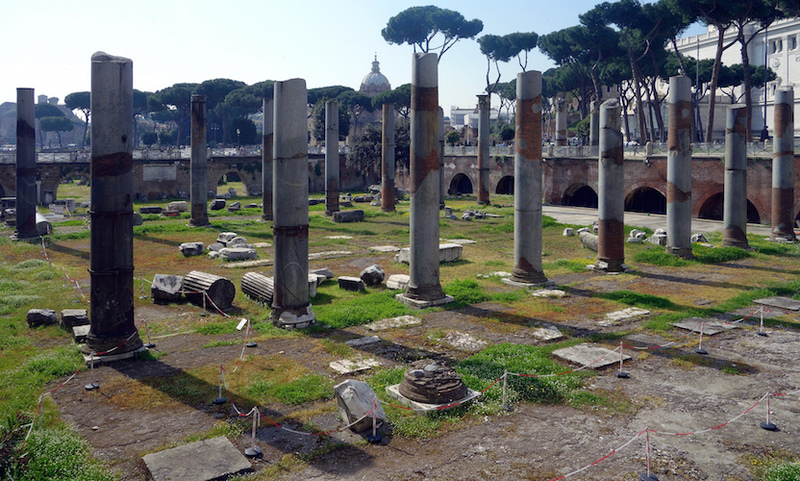 The main square of the forum was once a vast space, screened by architecture on all sides and paved in white marble. Several rows of trees, and perhaps rows of statues, ran parallel to the porticoes. Entry to the forum square was from the south, by way of a triumphal arch surmounted by a statue of Trajan riding in a triumphal chariot. Although the arch itself is no longer extant, it is depicted on a coin issued c. 112-115 C.E. (below). 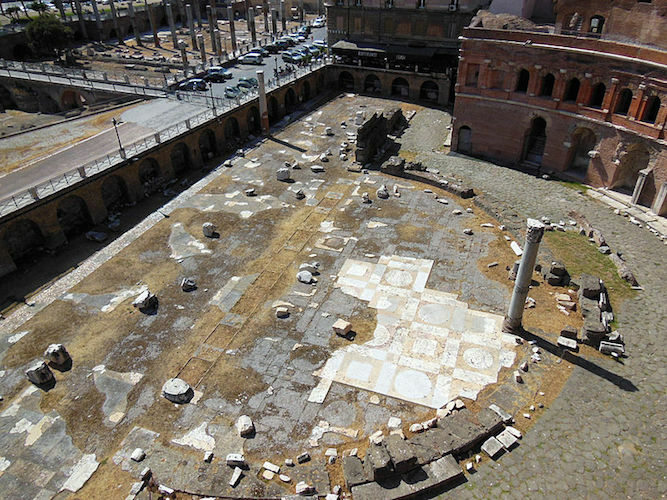 The forum square (116 x 95 meters) has an overriding martial theme, reminding viewers and visitors that the forum was constructed from the proceeds (manubiae) of Trajan’s successful military campaigns against the Dacians (101–102, 105–106 C.E.). 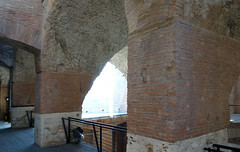 The porticoes were decorated with statuary and military standards (official emblems of the legions), as described by the ancient author Aulus Gellius: “All along the roof of the colonnades of the forum of Trajan gilded statues of horses and representations of military standards are placed, and underneath is written Ex manubiis [from the spoils of war] …” (Attic Nights 13.25.1). 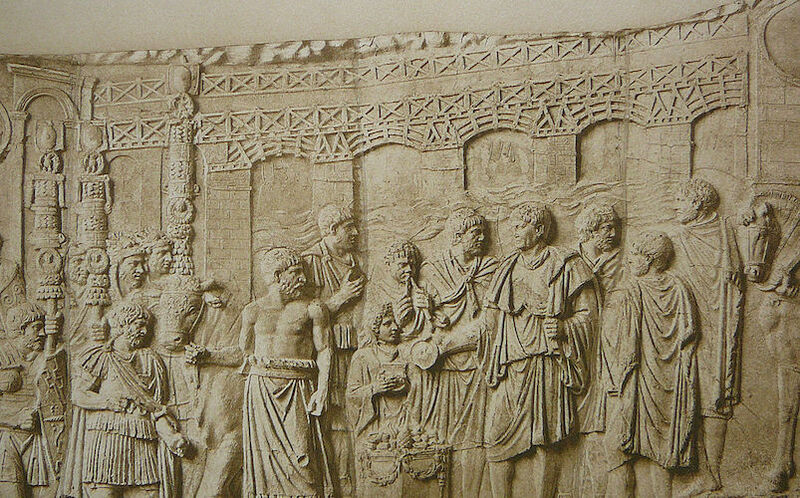 The decorative program also included statues of captured Dacian prisoners (left) and, it seems, statues of notable Roman statesmen and generals that were set in the intercolumnar spaces of the porticoes. At the center of the Forum square stood a bronze equestrian statue of Trajan, the Equus Traiani. While the statue itself does not survive, the occasion of a visit to Rome by Constantius II (in 357 C.E.) preserves a mention of the famous equestrian: “So he [Constantius II] abandoned all hope of attempting anything like it, and declared that he would and could imitate simply Trajan’s horse, which stands in the middle of the court with the emperor on its back.” (Ammianus Marcellinus 16.10.15) We also see the equestrian statue depicted on a silver denarius struck at Rome c. 112-114/5 C.E. (below). 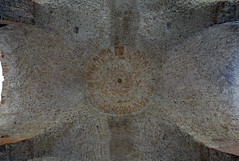 As an architectural type, the basilica is uniquely Roman and served various civic and juridical purposes. The habit of planners from the first century B.C.E. onwards had been to prefer to use the basilica as a framing device, so as to have it communicate with the flanks of a forum square. We see this in many cases, although with some variation. In the case of the Forum of Trajan the massive and monumental Basilica Ulpia is constructed at the northern edge of the open courtyard. It thus serves to bisect the complex, with the portico-lined courtyard lying to its east and the libraries and the Column of Trajan to its west. The basilica is massive—its overall length is some 169 meters and the interior nave is 25 meters wide. 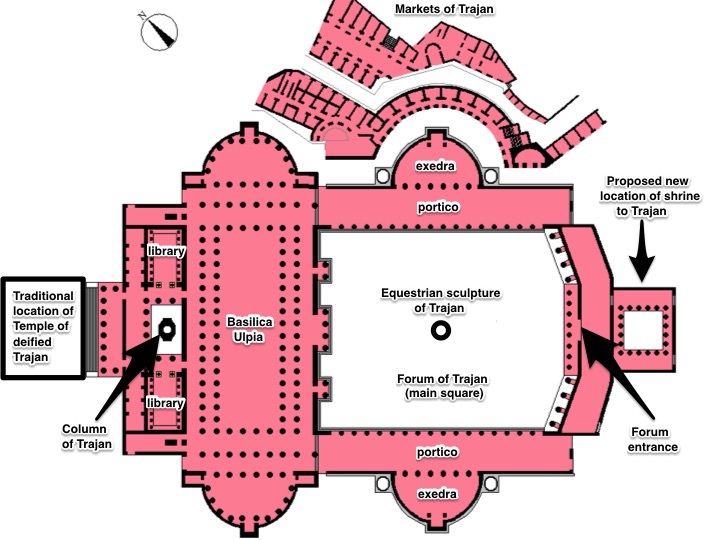 It is apsidal at both ends, with a raised central floor, and the main hall has a double surround of columns (96 in total) that were probably of white or yellow marble, in the Corinthian order. The basilica was also famous in antiquity for its gilded bronze roof tiles, as commented on by Pausanias, who remarked that the building was “worth seeing not only for its general beauty but especially for its roof made of bronze” (Description of Greece 5.12.6). 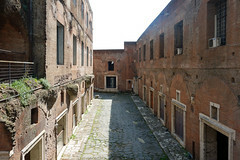 Adjacent to the Forum of Trajan is a separate architectural complex attributed to Trajan that is commonly referred to as the Markets of Trajan. 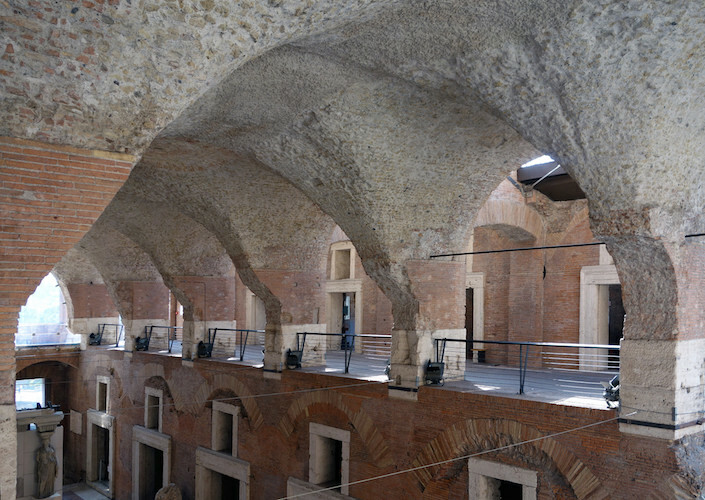 This multi-level commercial complex was built against the flank of the Quirinal Hill which had to be excavated for the purpose. 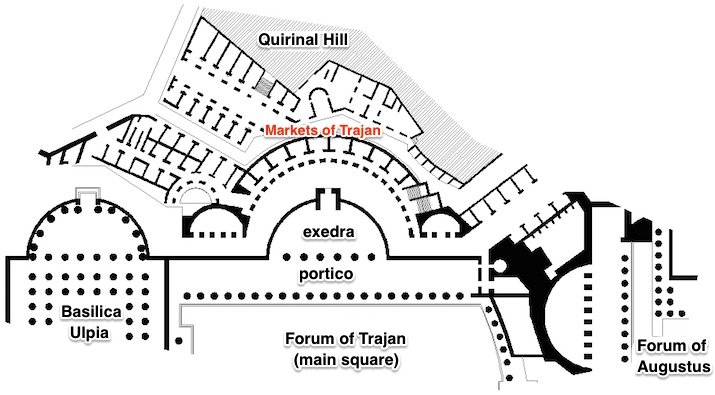 The complex of the markets takes its planning cue from the eastern hemicycle of the Forum of Trajan. 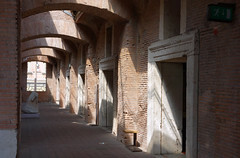 The ruins of the markets today preserve 170 rooms and the complex covers a space of approximately 110 by 150 meters; its walls stood to 35 meters above the level of the pavement of the Forum of Trajan. The original extension is hard to ascertain, based in part upon subsequent re-use and construction in the Medieval period (and later). 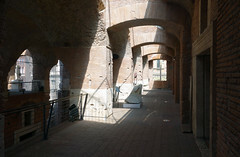 The archaeologist Corrado Ricci (1858-1934) cleared the ruins in the twentieth century, but the markets themselves have received comparatively less attention than the adjacent forum. Apollodorus of Damascus, The Markets of Trajan, 112 C.E. (photo: Steven Zucker CC BY-NC-SA 2.0)The function of the markets was mercantile—indeed the markets may have been designed to relocate shops (tabernae) and offices that were displaced by the Trajanic building project. 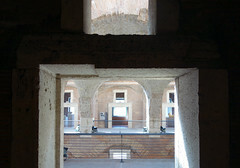 The ground floor offices (at the forum level) were likely occupied by cashiers of the imperial treasury (arcarii caesariani), while upper level rooms may been leased out or used by imperial officials associated with the grain dole (annona). 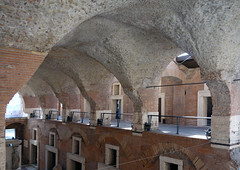 The great, vaulted market hall (above) is an ambitious and brilliant design—just as with the rest of the complex, reflecting the skills of the designer / architect who executed the project. The medieval Militia Tower (Torre delle Milizie ) (12th century) and the now-demolished convent of Santa Caterina a Magnanapoli utilized portions of the structure of the market’s buildings. 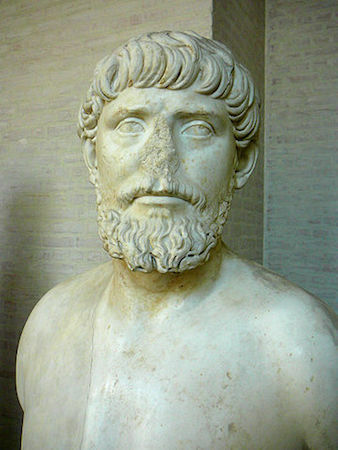 CC BY-SA 3.0)Apollodorus of Damascus was a military engineer and architect who was active during the first quarter of the second century C.E. 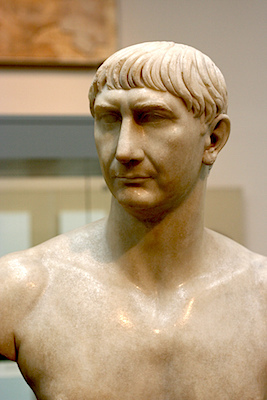 He accompanied the emperor Trajan on his campaigns in Dacia and is famous for building a bridge across the Danube river that was both described by ancient authors and depicted in art. The relief from the Column of Trajan depicts the bridge in the background (see below). Built c. 105 C.E., the segmental arch bridge was the first across the lower Danube and allowed Roman soldiers to cross the river easily. Apollodorus, who is described as “the master-builder of the whole work” is credited with the project (Procopius, Buildings, 4.6.11-14; tr. H.B. Dewing). Upon return from the Dacian Wars, Apollodorus is thought to have been the architect behind the project that produced the Forum and Column of Trajan, as well as the adjacent markets. A textual tradition is preserved by Cassius Dio that has Apollodorus running afoul of (and being executed by) Hadrian, Trajan’s successor, although it is unclear whether credence should be given to this story (Cassius Dio, Roman History, 69.4; tr. Cary). 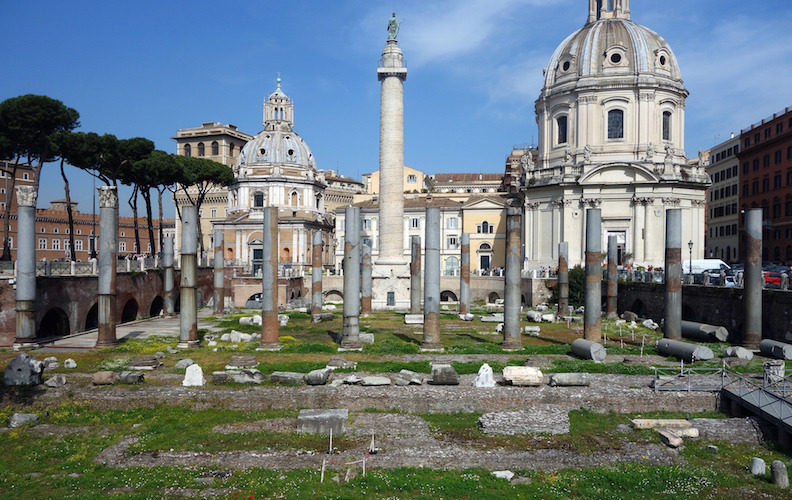 The Forum of Trajan earned a great deal of praise in antiquity—and it has been the focus of scholarly study perhaps since 1536 when Pope Paul III ordered the first clearing of the area around the base of the Column of Trajan. Paul III would then protect the column itself in 1546 by appointing a caretaker to look after it. The seventeenth and eighteenth centuries saw various artists and architects produce renderings and plans of the forum and its monuments. Among the most famous of these are those of Dosio (c. 1569) and Etiénne Du Pérac (1575). In terms of public architecture in Imperial Rome, the Forum of Trajan complex is a crowning achievement in its vast monumentality. The execution of its sophisticated and elegant design surpassed all of its predecessors in the complex of forum spaces in the city. The value of vast public spaces in the city of Rome cannot be underestimated. For the average city dwellers accustomed to narrow, dim, crowded streets the soaring, the gleaming open space of the forum, bounded by elaborate architecture and sculpture, would have had a powerful psychological effect. The fact that the monuments glorified a revered leader also served to create and reinforce important ideological messages among the Romans. Overall the role of public architecture in the Roman city, and the Roman consciousness, is an important reminder of the ways in which Romans used built space to establish and perpetuate messages about identity and ideology. The enduring ruins, in this case cleared initially by the excavations sponsored by the Fascist regime of Benito Mussolini, stand as strong, and stark, reminders of these Roman realities. 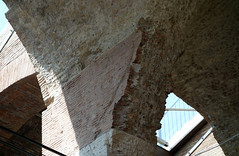 Modern viewers still extract and reinforce ideas about identity based on looking at and visiting the ruins. Even with these ruins we still come away with an idea about Trajan’s greatness and his martial accomplishments. We might, then, judge the architectural program to be a great success—so successful that a great many of our own public monuments still operate on the basis of conventions established in antiquity. J. C. Anderson, Historical Topography of the Imperial Fora (Brussels: Latomus, 1984). R. Chenault, “Statues of Senators in the Forum of Trajan and the Roman Forum in Late Antiquity,” The Journal of Roman Studies, vol. 102 (2012), pp. 103-132. P. Gros, L’architecture romaine du début du 3e siècle av. J.-C. à la fin du Haut-Empire 1. Les monuments publics (Paris: Picard, 1996). L. Lancaster, “Building Trajan’s Markets,” American Journal of Archaeology 102.2 (Apr., 1998), pp. 283-308. L. Lancaster, “Building Trajan’s Markets 2: The Construction Process,” American Journal of Archaeology 104.4 (Oct., 2000), pp. 755-785. R. Leone, et al. Fori imperiali: demolizione e scavi: fotografie, 1924-1940 (Milan: Electa, 2007). 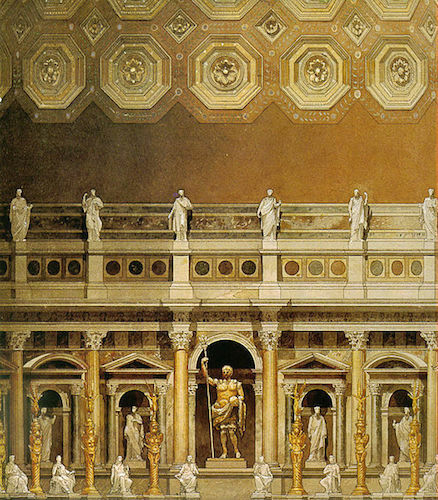 W. L. MacDonald, The Architecture of the Roman Empire 2 vols. (New Haven : Yale University Press, 1982-1986). R. Meneghini, L. Messa, and L. Ungaro, Il foro di Traiano (Rome: Fratelli Palombi, 1990). R. Meneghini, Il Foro e i Mercati di Traiano: Roma (Rome: Istituto poligrafico e Zecca dello Stato, 1995). J. E. Packer, K. L. Sarring, and R. M. Sheldon, “A New Excavation in Trajan’s Forum,” American Journal of Archaeology 87.2 (Apr., 1983), pp. 165-172. J. E. Packer, “The West Library in the Forum of Trajan: The Architectural Problems and Some Solutions,” In Eius virtutis studiosi : classical and postclassical studies in memory of Frank Edward Brown (1908-1988) (Studies in the History of Art, Vol. 43, Symposium Papers XXII), edited by A. R. Scott and R. T. Scott, 420-444. (Washington D.C.: National Gallery of Art, 1993). 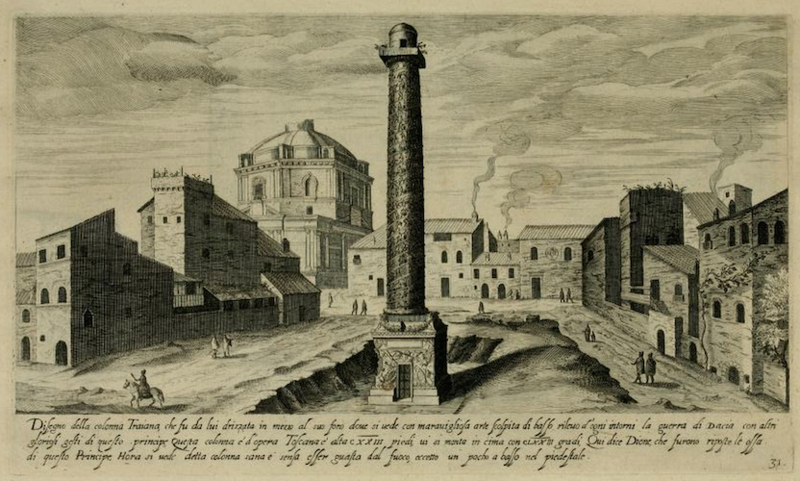 J. E. Packer, “Trajan’s Forum again: the Column and the Temple of Trajan in the master plan attributed to Apollodorus(? ),” Journal of Roman Archaeology 7 (January 1994) pp 163-182. J. E. Packer, “Report from Rome: The Imperial Fora, a Retrospective,”American Journal of Archaeology 101.2 (April 1997), pp. 307-330. J. E. Packer, The Forum of Trajan in Rome: a study of the monuments. 2 v. (Berkeley: University of California Press, 1997). J. E. Packer, The Forum of Trajan in Rome: a study of the monuments in brief (Berkeley: University of California Press, 2001). J. E. Packer and J. Burge, “Templum Divi Traiani Parthici et Plotinae: a debate with R. Meneghini,” Journal of Roman Archaeology (January 2003) pp. 103-136. L. Ungaro et al. 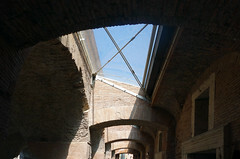 The Museum of the Imperial Forums in Trajan’s market (Milan: Electa, 2007). P. H. von Blanckenhagen, “The Imperial Fora,” Journal of the Society of Architectural Historians 13.4 (Dec., 1954), pp. 21-26. M. Waelkens, “From a Phrygian Quarry: The Provenance of the Statues of the Dacian Prisoners in Trajan’s Forum at Rome,” American Journal of Archaeology 89.4 (Oct., 1985) pp. 641-653. G. Wightman, “The Imperial Fora of Rome: Some Design Considerations,” Journal of the Society of Architectural Historians 56.1 (March 1997) pp. 64-88. Cite this page as: Dr. Jeffrey A. Becker, "The Forum and Markets of Trajan," in Smarthistory, August 8, 2015, accessed April 21, 2019, https://smarthistory.org/forum-and-markets-of-trajan/.